With sheltered islands, crystal clear waters, steady winds and the kind of scenery from the Mamma Mia films, the Ionian is a stunning part of the Mediterranean and certainly one of the best sailing areas in the entire world. It’s no wonder why the area attracts so many return visitors year on year – with seemingly more unspoiled bays and charming harbours to explore upon each visit, the Ionian just keeps on delivering. Steeped in Ancient Greek history and home to the traditional delights of tangy tzatziki and refreshingly cold Mythos beer, what’s not to love about this gem of a place. We agree that along with some awesome sailing, you really can’t go wrong with this place. If you are a family looking to take the youngsters on an action-packed yet ultimately relaxing holiday, then this is for you. To ensure the holiday organising is smooth sailing, we have given you some pointers! When do I visit and how long do I sail for? The sailing season in the Ionian typically runs from April until the end of October giving you 7 months to choose from and something different to expect from each month. The start of the season is a special time of the year when the locals appear to be particularly welcoming after a winter of no tourists and the summer brings long, hot summer days with an inviting sea temperature. The autumn also brings warm seas with considerably fewer boats around. Incidentally the school holidays are when we run our invaluable informal flotilla assistance. The informal flotilla runs to accommodate families and couples or anyone who wants a truly stress-free holiday. The helping hand of our lead crew in harbour each evening finding perfect moorings, giving advice on the weather and everything in between… If you are a qualified skipper but together with your family lack experience, then the informal flotilla is something to consider. There are also a couple of flotilla weeks scheduled outside of the school holidays, read more here. If you are not tied to school holidays, then consider the mid-season months of June & September. Expect wall to wall sunshine, consistent winds and secluded picturesque bays as well as legendary Greek hospitality. When it comes to the duration of a sailing trip, if you have the budget and time to extend your holiday past 7 days then you will not regret pushing the boat out to enjoy a 10 or 14 day sailing holiday. Our unique 10-day charters really do allow you to find your sea legs for the first couple of days and then spend the rest of your holiday unwinding. Insider tip: Whether you choose a 10-day holiday, or you decide to sail for 7 days from Wednesday-Wednesday, both options offer you sailing over the weekend which is a fantastic way to explore some of the busier harbours at the quietest time of the week when most companies have their changeover days! Flights available several days a week into the local airport of Preveza, visit the travel page for more info. With hundreds if not thousands of charter companies located in the Mediterranean, how on earth do you begin to decide which company to choose? Do you choose the large-scale company with hundreds of boats across a variety of bases? Do you choose the small, personalised company who know their boats individually? When browsing the internet for a price for your sailing holiday, it’s important to find out EXACTLY what is and isn’t included. No one likes a charge at the end of their holiday that they weren’t expecting, so make sure you find out the ins and outs of the price you see. You may find a yacht that is an impressively low price but find out why. What extras are there to pay? What does this price include? Our blog post on our extensive range of Added Value Features clearly outlines everything that we throw in, including free stern-to mooring practice, detailed yacht handover, full route planning and an impressive welcome pack onboard when you arrive! Most importantly though is the back up support, even for ‘bareboaters’ venturing around the Ionian by themselves – assistance or advice is no further than a phone call or a fast RIB ride away. The family feel of the our team and personalised service from initial enquiry to when you arrive in Greece is unique and hard to come by. Which yacht do I choose? Insider tip: choose the easy option! In mast furling is a must for first-timers and for a family looking for a big enough space on a not-too-big a boat, twin helms together with a large drop-down bathing platform – both commonly found on modern cruising yachts – will really open up the cockpit into a comfortable living area. 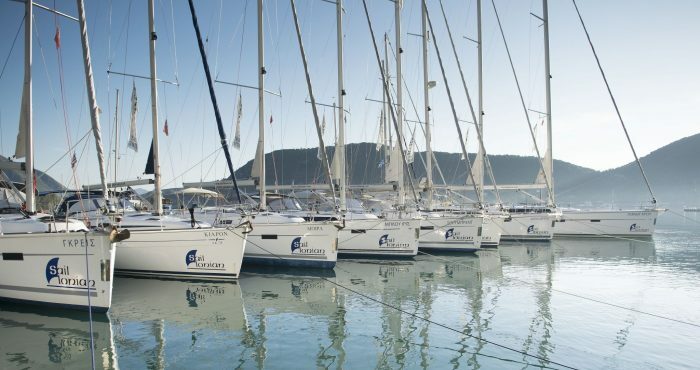 The Greek Law is that the absolute minimum requirement to charter a yacht – whether that be bareboat OR on flotilla – is RYA Day Skipper or an ICC for sailing. If you hold either of these or an accepted equivalent qualification, then you are a perfect candidate for a bareboat yacht charter in Greece, or to join the informal flotilla. Our RYA training school could be the solution if you don’t currently hold a recognised certificate. Private courses start from £1600, group courses available for individuals looking to join others from £660 and the ever-popular family courses with Mum or Dad taking RYA Day Skipper whilst the children work through the introductory RYA Competent Crew course are run throughout the season – a great way for a hands-on sailing experience in the Ionian. If you are qualified but a little rusty, the Assisted Sailing scheme involves a skipper on board for an afternoon, a full day or even a couple of days to show the whole crew the ropes again. Alternatively, a skippered yacht charter is open to anyone – qualified or unqualified – who fancies maximum relaxation. 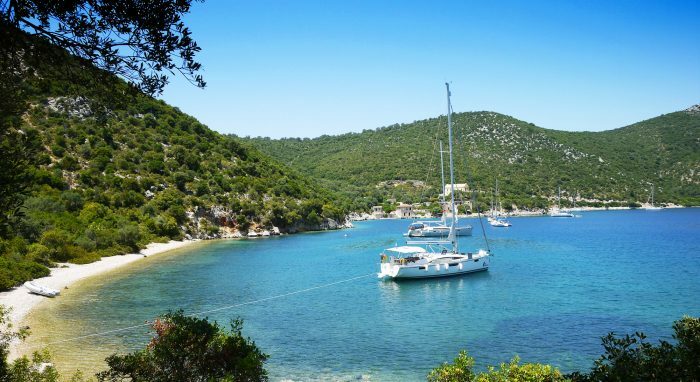 Skippered yacht charters not only give you the reassurance and confidence to have the Greek sailing holiday of a lifetime but flexibility too. A crewed yacht has many advantages for families that want the experience of a sailing holiday without the pressure of looking after the boat. Now for the exciting part of holiday planning: researching the beautiful hidden gems of the Ionian! It’s no secret that over recent years this seemingly unbeatable holiday destination has become more and more popular – and you can see why. 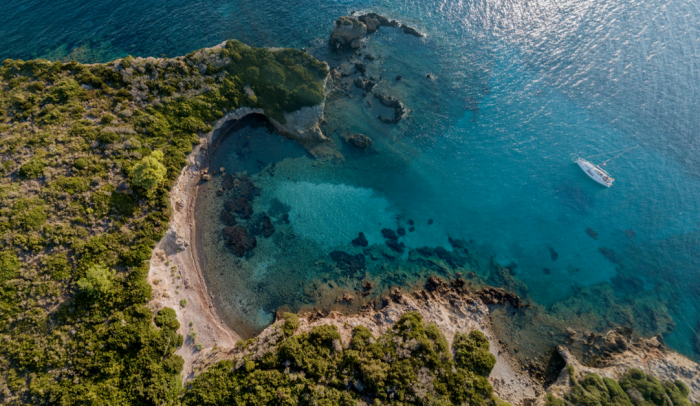 Parts of the Ionian are still far enough off the beaten track to offer charming island living and other areas have established themselves as more exclusive hideaways. Most sailing in the Southern Ionian is line of sight meaning you’ll be able to see all of the islands you plan on visiting fairly easily. It is no more than 10 miles between each island with many harbours and bays within a couple of miles of each other. The prevailing breeze is North Westerly which tends to be light in the mornings around force 2-3 and build during the afternoons to around force 4-5-6. For seasoned Ionian sailors, you will know that the weather here is very localised and although planning a route is all well and good, most decisions on where to sail each day are best made once you have looked at the wind direction outside of the harbour. There is virtually no tide in Greece and very few hazards to look out for – with the exception of the Herimiti Shoal between Scorpios and Meganisi! Our RYA Chief Instructor Craig has written about his Favourite Route Plan here and also his Top 10 Anchorages in the Ionian, both of which provide priceless local knowledge and experience. There’s an interactive map on the Sailing Area page which presents an insight into the most loved harbours, bays and overnight stops in the Southern Ionian. So take these helpful hints and tips when you are booking your sailing holiday, and you shouldn’t go far wrong! Or contact us in the office on info@sailionian.com for personalised advice on sample itineraries, choosing the yacht for you and for a tailored holiday quotation!